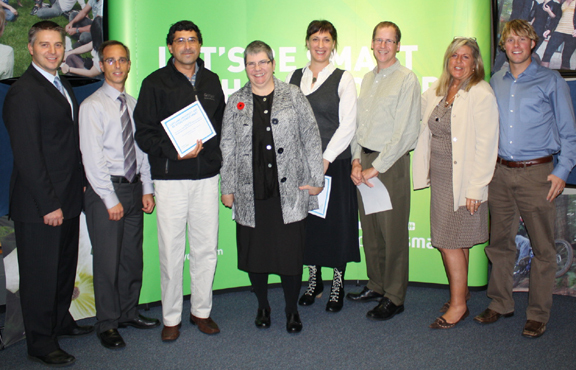 BC Hydro presents prizes to the Cap U winners of a sustainability challenge contest. Four Capilano University instructors were acknowledged by BC Hydro on November 8 for successfully embedding sustainability and conservation into their existing programs and course materials. A cheque for $2,000 each went to Cap’s psychology instructor Dr. Rajiv Jhangiani (missing from photo); tourism and outdoor rec instructor, Roy Jantzen (third from right); and English instructor, Dr. Aurelea Mahood (fourth from right). Tourism and business instructor, Jorge Oceguera (third from left), won a $100 gift certificate for creativity and imagination. On hand to present the prizes were BC Hydro program manger Simon Vickers (far left), BC Hydro key account manager Ron Mastromonaco (second from left), and Capilano University president Dr. Kris Bulcroft (fourth from left). Also seen in the photo are Cap’s energy manager, Laura Williams (second from right), and energy specialist, Colin Dalziel (far right). The instructors took part in the inaugural BC Hydro challenge contest to help create a culture of energy literacy in B.C. by building capacity within all disciplines of education. The contest was held in conjunction with the Sustainability in Education Across the Province conference hosted at Cap last May. Since the inception of energy management at Cap, the institution has realized more than $424,000 in energy savings and raised more than $1.3 million in external funding (more than 50% coming from BC Hydro). The university is close to reaching its five-year goal of a 25% decrease in energy consumption, set in 2008. With utility rates and resource costs unstable and typically rising, energy management offers an investment into the university. Conservation and strategic energy management makes sense financially, environmentally, and socially. With fiscal and environmental stewardship integral to each other and by modeling sustainability at Cap, the university will benefit from improved indoor and outdoor spaces, lower risk adversity and greater financial stability, all while reducing its energy costs, consumption and carbon footprint.